I described in a previous post (Blogging the Wheel) how vast searching (the pedabyte era) could reveal those writings or the connection of writings to the authors who may first have penned them. This might greatly improve the quality of discourse or stimulate discourse. The value of knowing as opposed to un-knowing is to clarify the values of tradition from the folklorist’s inability to find the composer of the form. But upon considering the subject further, I’m reasonably certain that making the writings of the past, and perhaps the music of the past available without specific goals (as the pedabyte era implies) could also improve and correct our understanding by demonstrating the wider scope of artful endeavors more broadly than previously considered. I am specifically considering the world of cowboy poetry and the not uncommon statement that cowboys were different, unique amongst working people, for their composing and reciting of metrical verse. “Cowboy Exceptionalism” we could describe this attitude. However as many reciters and creators of cowboy poetry as well as commentators have noted is that often recitations at gatherings are not always about working cattle, but embody values shared by buckaroos and their audiences. 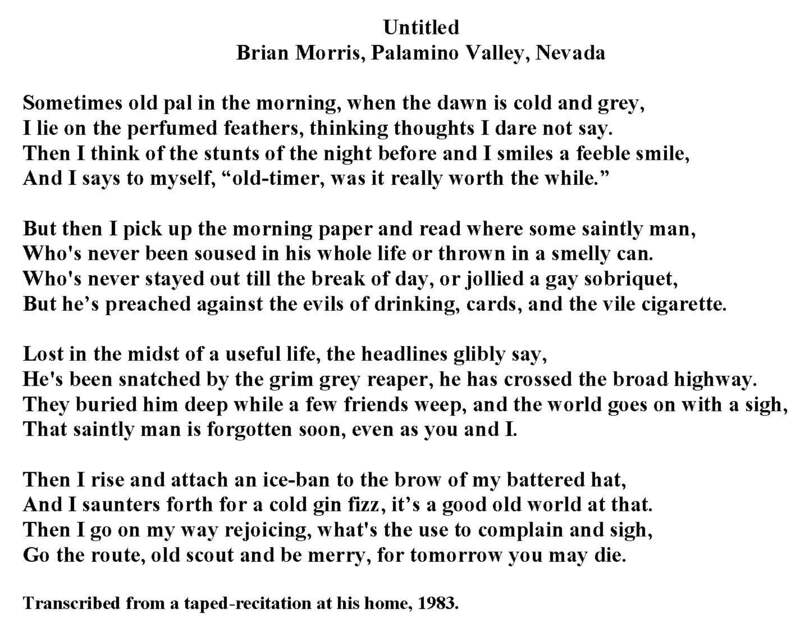 Brian Morris’ untitled poem described in the previous post is such a poem. The value of such a description in the present is up to the audience and the person who writes, reads, or recites from memory the verses. Unlike some folklorists, my experience with reading and talking with rural people who grew up in the past is that recitation and versifying were social skills that knew no geographic boundaries and no economic barriers to participation. What I have been most interested in recovering is the recitation tradition, having just missed the real searing effects of that form of learning. In grade school we had to memorize the “Declaration of Independence,” the “Preamble to the Constitution,” and the “Gettysburg Address.” Older people whom I have visited with told of learning long poems and speeches for school closings and other public events. 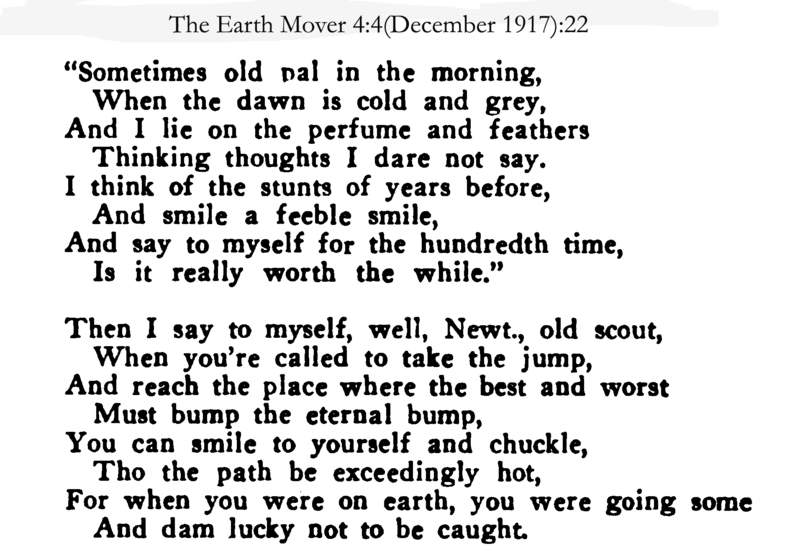 Somehow with the Sputnik launch and the move to make us all scientists, the memorization of long poems was abandoned. The Pedabyte era brings to us the possibility of researching and rediscovering the breadth and depth of metrical verse in social discourse of the late nineteenth and early twentieth centuries. 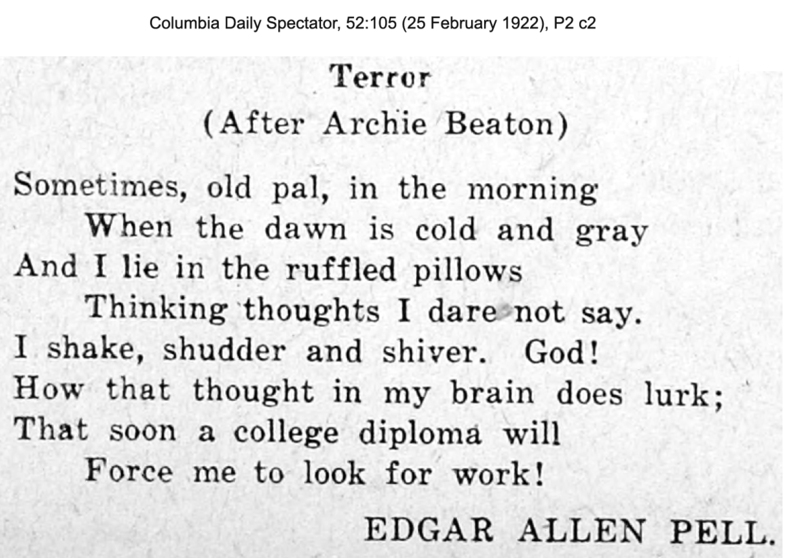 Just as no newspaper resisted the temptation to include rhymed couplets of wit or wisdom, virtually no American Federation of Labor affiliated trade journal, or college yearbook was deficient in a share of metrical compositions. The fluidity of these forms suggests not plagiarism, but rather the priority given to the context of publication, not to the source of the creation but the goal of recitation, not reading. It seems apparent that research into both the volume, topics, and literary dialects of the material would make our histories of life and times of the past more nuanced and complex. 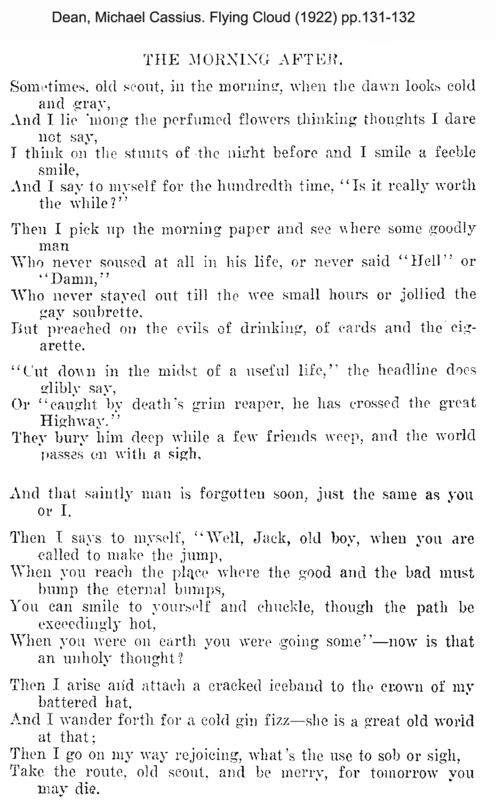 For example, consider a poem in the prior blog named for ease of writing “Was it really worth the while?” (This is not Joaquin Miller’s poem “Is It Worth While?) 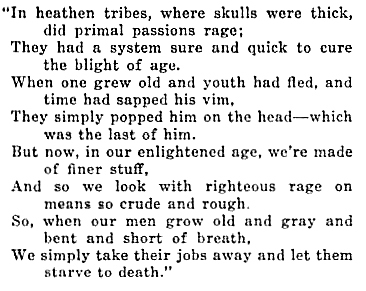 This poem was published in newspapers across the country (The Pensacola Journal, Ironwood (MN) Times, Tulsa Daily World, Clark Country Review) and had considerable interest for the trades at the end of the first decade of the 20th century. It also found favor with men’s colleges of the time. 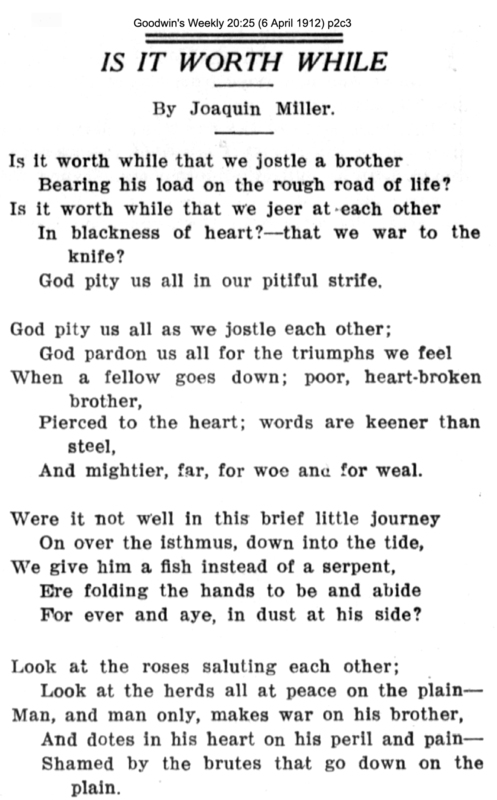 Between 1909 and 1918 the poem was variously published in The Plumbers’ Trade Journal, The Hardwood Record, Phi Beta Pi Quarterly (Chicago Dental College), The Bridgeman’s Magazine, The Iowa Unionist, The Clay Worker, The Longhorn (Texas A&M), The Hardware Reporter, The Cadet (VMI), The American Flint Glass Workers, The Bomb (VMI), Paper-Makers Journal, The Earth Mover, Steam, Shovel, and Dredge, and Columbia Daily Spectator (as a parody). 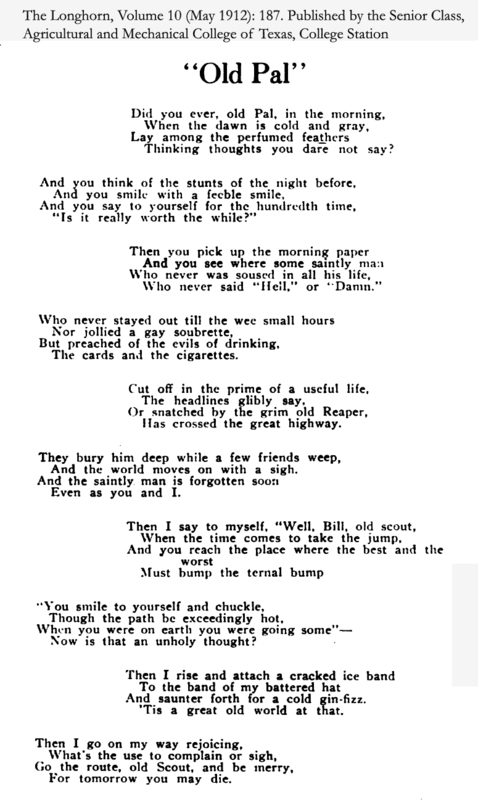 In 1918 the poem reaches another audience, the men’s club and dinner circuit, published by John McClure, a poet and columnist in New Orleans, in the Stag’s Hornbook, for A. A. Knopf. 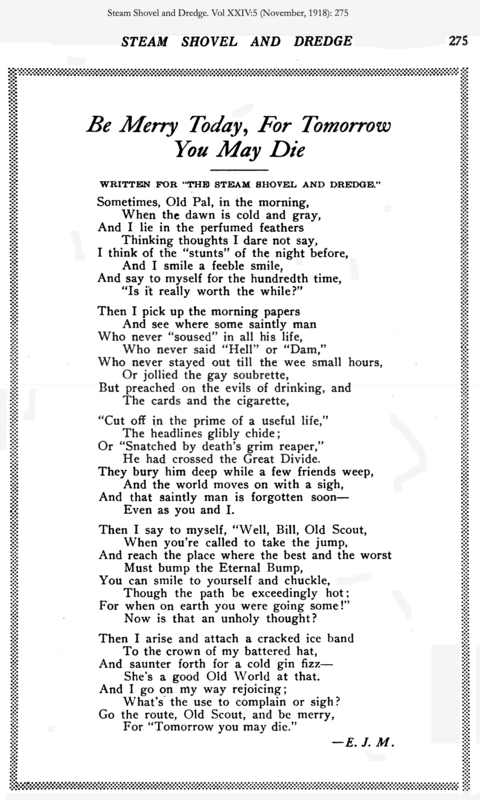 The poem still has legs and like many other poems is “collected” by Michael Cassius Dean, and published in “Flying cloud, and one hundred and fifty other old time songs and ballads of outdoor men, sailors, lumber jacks, soldiers, men of the Great Lakes, railroadmen, miners, etc.” [Virginia, Minn., The Quickprint, 1922.] A couple of these institutions published the poem twice, such as when the Chicago School of Dentistry became part of Loyola University, the new year book Dentos published the poem in 1927. 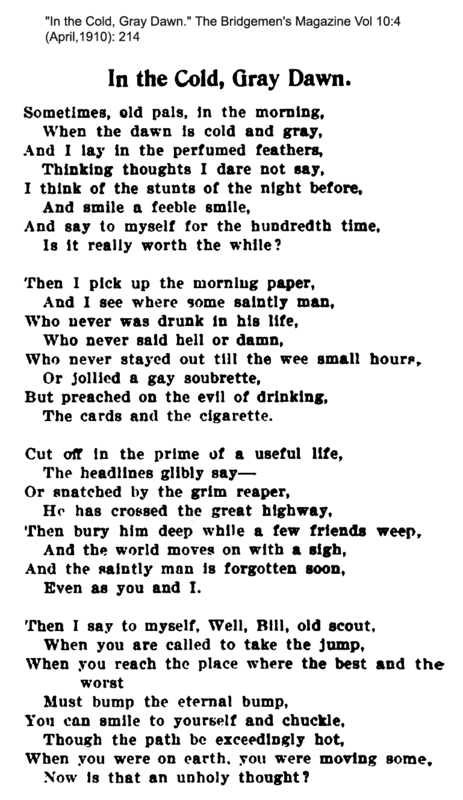 By the 1930s the poem has become the stuff of “older times”. However, Northwestern University still published this poem as “What’s the Use?” as an “exchange” with another institution. 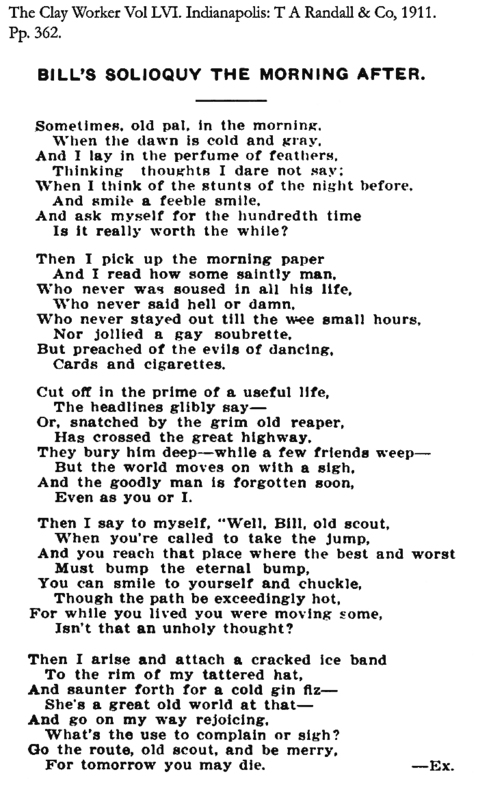 The glow of remembrance brought the poem to the “Notes and Queries” section of the New York Times, where Helen Fellman (the editor) selected it for the immensely successful collection, The Best Loved Poems of the American People, [Doubleday, 1936. Pp. 621]. 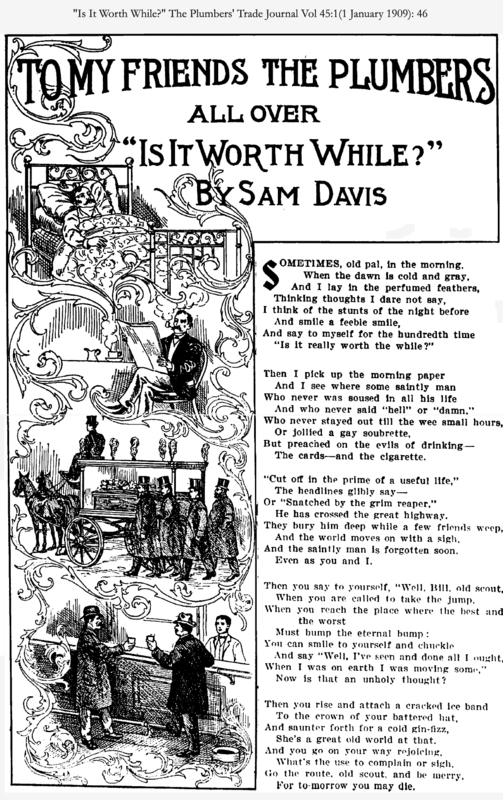 “The State Goes Dry” (a parody on prohibition), “Be Merry Today, For Tomorrow You May Die” “What’s the Use?” and “Is It Really Worth the While?” What’s more although many newspapers or publications list the author as “anonymous” “correspondent,” or “exchange,” there still a number of other people claiming or attributing authorship: Sam Davis, Frank F Fish, Ned D Lewis MD, F. L. Scharfle, C.U.B., L. K. M. ’15 [L. K. Moore], E. J. M., C W Aplin (parody), Edgar Allen Pell (parody). No named attribution has ever been found twice. This willingness to connect attribution is more in keeping with the formula of ear-playing fiddler’s who attribute the tune to the person whom they learned it from, “Quince Dillion’s High D”, for example. What do you make of this overblown blog on carpe diem, Gaudeamus igitur, or ubi sunt? The Ballad Index by Robert B. Waltz and David G. Engle cite the Dean collection (1922) and Steve Roud classifies this as Roud #9588. The problems of classification make every attempt for textual analysis quixotic because of the multiple intentions of writers and reciters. 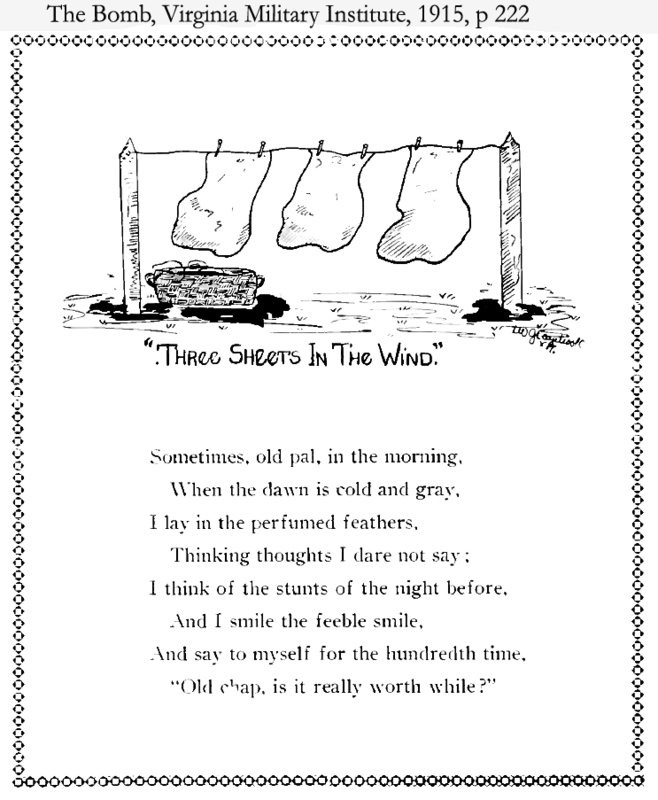 The poem is simultaneously pensive and joyful. One great service of this “pedabyte era” to folklore then will be to bring greater inter-textuality to the sub-literary forms of verbal arts. This formlessness of the domain of possibility is (I believe) a truer stance to the multiplicity of performers and potential audiences, giving greater light to the granularity of the text as it is made serviceable to the particular audience each iteration serves. We’re into the homestretch of this Domain of one’s own class. There have been enlightening and bewildering moments and as Yogi would say “It ain’t over ’till its over.” But after reading the material for our last meeting I can’t connect the dots of using social media to facilitate learning for our students and polish our professional appearance available to like-minded participants. I view myself as one of the “little” people, the users of internet. I work for a living, try to be nice (or at least polite) to the people I meet. I have very limited degrees of freedom, but when I do have choice I try to be considerate and anticipate how my actions will affect others. I am not a saint, nor am I an app builder (in either the hardware or software use of the term). Because I lack access, through my inability to interface with venture capitalists, and I lack scale because I’m trying to reach perhaps one hundred and fifty people, not billions, I won’t even try to explain what these readings provide me in my uncertain quest to provide a learning environment for my students. I’m anxious to read and hear where others saw revelation and empowerment.